Less than 60 days until UDA. | the writings of sylvia a. As their fellow students are preparing to leave campus for the Thanksgiving holiday, these 22 peppy girls are warming up stretching their muscles. Each girl, different in their own way, ranged from freshmen to seniors, short to tall, differing majors and various dance backgrounds. These girls came together on a Sunday evening at 5:30 p.m. with a specific goal in mind: to win at the 2015 Universal Dance Association collegiate competition. Each girl had a slick tight pulled back bun while wearing a black team top, black spandex shorts and black jazz shoes on. Uniformity was this team’s priority. “It’s Dancegiving,” says Nicole Desz, one of the two-year co-captain’s for the prize winning Towson University Pom Squad. Nicole Desz, a petite girl, has long, straight brown hair pulled back into a ponytail. As she spoke, her deep Long Island accent came out emphasizing more words than the other. Taking off her black and gold jacket, she was left wearing a black team top, black sweats, black spandex shorts underneath and brown comfy moccasins with her mismatched socks creeping out. The Pom squad refers to this area as, “The Mezz.” “We still need a lot of work to do, but I have faith in our girls,” says Desz. “And less than 60 days until UDA!” responds Maria Randlett-Tydings, the other two-year co-captain for the Towson University Pom Squad. Her hair resembling that of Shirley Temple’s curls: tight and blonde as she was wearing a loose teal sweater over black sweats and black combat boots. Her big hazel eyes were bursting with energy ready to start the practice. “We have to hurry up!” yells Desz. “And make sure you all are ready to dance after stretching!” responds Randlett-Tydings finishing Desz’s sentence. Like-minded and complementing one another, Randlett-Tydings is the ying to Desz’s yang. The Universal Dance Association College Dance Team National Championship is the most prestigious collegiate championship in the country and has been going on for more than 35 years, according to the Universal Dance Association’s website. This will be Towson University’s first bid into being able to attend this competition. “It’s the Superbowl of all competitions to collegiate dancers nationwide,” says Desz. Not only will this competition be able to push the team’s limits and dance skills, but will also allow them to perform to their greatest abilities. The 2015 Dance Team National Championship will be held January 16 – 18 in Orlando, Florida, which will later be televised on ESPN. “UDA is the most competitive competition throughout the country, so we knew by entering the team into it, we would present a new and exciting challenge for the team,” says Desz. “Our biggest accomplishment is making a new name for the Pom Squad,” says Randlett-Tydings in excitement. 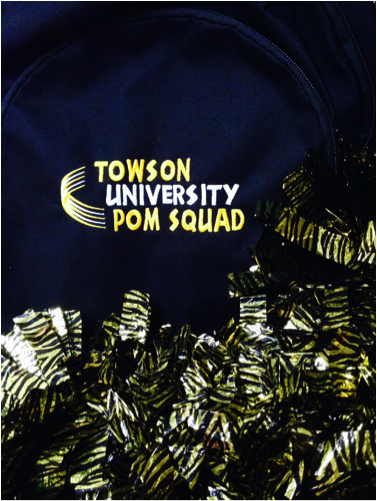 Randlett-Tydings and Desz are happy to have one another by being able to transform and improve the Towson Pom Squad. “We as captains, want the Towson community to take the Pom squad seriously as a cheer and dance team,” says Randlett-Tydings. “No matter what happens at UDA, I feel like it is only going to make our team closer,” echoed a similar response from Randlett-Tydings. Week after week, Desz and Randlett-Tydings continually come up with different choreography and routines. “The choreography just flows and comes to us because it is something that we have been around our whole lives,” explains Desz. “I have always been the type of individual who has had a lot on her plate, but because we are all dancers, dance is something that has taken up a large portion of my life at any given time,” mimics Desz, similar to Randlett-Tydings answer. Both Desz and Randlett-Tydings each set up a time out of their daily schedule in order to meet, make decisions and discuss issues involving the team. Kaitlin Wynne, a four-year Towson poms squad member, has seen the changes of the Towson Poms Squad firsthand witnessing its growth. “Going to UDA is definitely the biggest accomplishment for us because we’ve always gone to Nationals and different dance competitions that have never really challenged our abilities,” states Wynne enthusiastically in comparison to Desz’s and Randlett-Tydings answers. “Nicole and Maria are two opposites that manage to work better together and play off each other’s strengths for choreographing dance routines and running practices,” says Wynne. Having met Desz and Randlett-Tydings from Pom Squad, they are the final three girls who have been on the team all four years throughout their entire Towson career. “They’re not like coaches because they still have fun, talk during practices and joke around with the other girls like the rest of us occasionally, but will always step up and take charge when things need to be done,” says Wynne. Going into such a high competition such as UDA, any little minor mistake can ultimately cost the team a bid into the final round and not being able to place. Each dance, pom and jazz, is broken down into parts during these practices to help Desz and Randlett-Tydings target problem areas of either routine. Towson University’s pom routine incorporates strong cheerleading motions; a turn sequence consisting of three-eight counts, advanced jumps and a kick line all put into one high-energy routine that must be no longer than one minute and forty-five seconds. “Holding the poms in each hand really makes me feel like I’m holding weights instead,” says Ventura. Girls hold a gold pom in their right hand and a black pom in their left creating swishes that followed each girl’s arm movements while the music plays. Mistakes are quickly pointed out and repetitive dance moves are done over and over again. These captains did not want mistakes, but only perfection. “One, two, three and four” echoes the Mezz as the team practices. “Five, six, seven and eight,” yells Randlett-Tydings counting each step during this routine. Each second is accounted for and no minute is there time to rest. The jazz routine on the other hand is a more slow-paced routine with a cover of Rihanna’s “We Found Love,” but still involves quick turns, leaps across the floor, a lift involving one of the dancer’s and four-eight counts of fouettes that seem never ending focusing on each girl’s core muscles and maintaining posture like a ballerina figurine. As 9 p.m. approaches, the practice slowly comes to an end, but in reality, the practice truly never ends for these girls. Each girl had a desire to put Towson University on the books for their first nationwide competition. “How are the formations looking like,” said one teammate with a big bright red bun. Plenty of “Have we improved from last week,” were asked by other teammates all at once. « Rolling Stone: Pop culture, politics and TV.